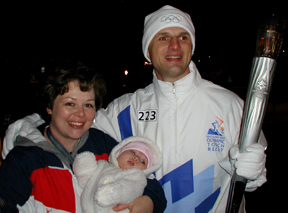 Lavyn our daughter (3 months old), Matt and Kim at the Olympic Torch relay, January 02. Matt with some very special friends..(from left to right, Ben, Ryan, Matt and Garrett) Garrett, who is blind and is fighting cancer, motivates Matt to keep going! Wow! Its been a long time since I have written. Four years...a lot has happened in our lives since our trip to Sydney, Australia. Matt and I now have an almost 3 year old daughter, Lavyn. Lavyn will be 3, on October 6, a week after Matt return's from Greece. October is a busy month as we will also celebrate our 7th wedding anniversary. And our second child will be born in December. The Athens Games is our third Paralympic medal pursuit. When Matt and I made the decision for him to compete at the 2004 Cycling Trials to, hopefully, make the 2004 Athens Paralympic cycling team, we were very well acquainted with the physical, mental, and financial challenges that would come with accomplishing such a dream. We knew the training schedule coupled with Matt's IBM job responsibilities, raising a 2 year old and me being pregnant would be exhausting. Also, we wanted our first child, born one year after the 2000 Sydney Games to benefit from this experience. We knew, despite fundraising and penny watching, we would be left with cycling bills. It is truly a family-stretching endeavor. When the stretching feels overwhelming, we remind ourselves of the many examples of positive change we have experienced. For instance, we can think of Garrett and his family. His father, Eric, read a Gazette newspaper article about Matt and decided to give him a call. (click here and you can read the Gazette article). Eric was depressed because his six-year old son was being blinded by brain cancer, and he assumed Garrett's life would be horribly diminished. Now, Eric has started the Rush Miller-Foundation aiding parents buying tandem bikes for blind children, and Garrett is excelling. (At the left you can see a photo of Matt with Garrett Rush-Miller (right) and his brother's, Ryan (top left) and Benjamin (bottom left). Few people can really appreciate the stories of sacrifice and toil accompanying every athlete approaching the starting line at an elite international competition such as the Olympics or Paralympics. All who succeed do so only with help from many others and a tremendous passion. Matt and I love working together in being a part of the Paralympic movement, it has truly been a very important part of our marriage and the Paralympic movement will continue to be an important part of our family. 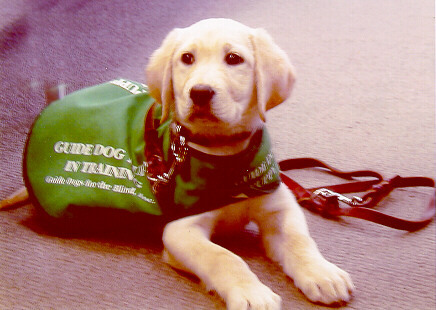 Hearty (photo below): Hearty, the guide dog puppy that we volunteered to raise, unfortunately, was dropped from the Guide Dog program because of allergies. Hearty made it to level 8 which means she only had one more level to graduate and would have then went on to "class" - which means she would have been matched with a blind person. Matt and I adopted Hearty and now she is a permanent resident at the King household...So sad, but we are proud of her and her success at school. Unfortunately, on Mother's Day - May 2001, we were forced to find Hearty a new home because Kim had a terrible allergic reaction to the grasses Hearty was bringing into our home. We found her a loving home four blocks from us and she seems to be doing great. We miss her terribly and giving her to a new family was one of the hardest times of our life, but we know she is safe and happy.